Framed: 10 9/16 x 7 3/4 in. 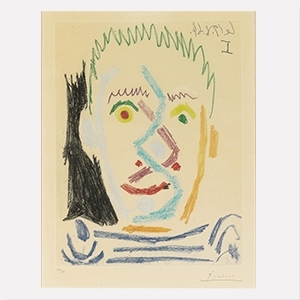 Picasso was born the son of an artist in Malaga, Spain, in 1881. 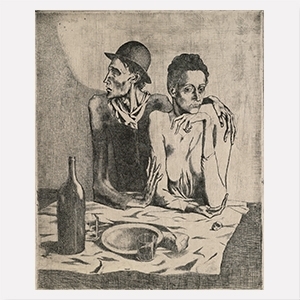 At first trained by his father, he studied art in Madrid and Barcelona, and moved to Paris in 1904. He lived and worked in France for most of is life. 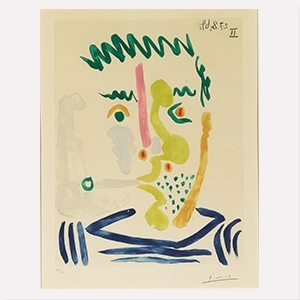 Picasso’s artistic genius impacted every major movement in early 20th century art: Realism, Abstraction, Cubism, Neoclassicism, Surrealism, and Expressionism. His earliest paintings of the so-called ‘Blue Period’ (1901-04) are characterized by simple outlines, a melancholic mood, and a blue tonality. Works of the subsequent ‘Rose period’ focus on acrobats and other circus performers, and feel more optimistic. Primitive art, especially African masks, strongly influenced his iconic painting Les Demoiselles d’Avignon (1906/7, MOMA, New York). Along with Georges Braque, Picasso is responsible for the development of Analytic Cubism in the early 1910s. 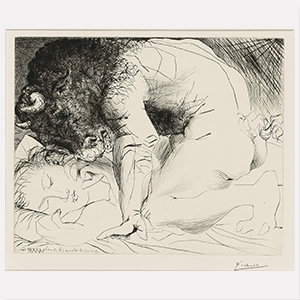 After a visit of Rome and Naples in 1917, mythological figures such as Minotaurs, nymphs, and fauns inspired his ‘Neoclassical period’. 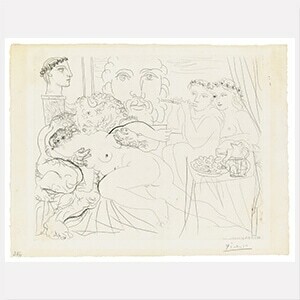 Picasso’s artistic output was enormous and never decreased, even in old age. During his lifetime, he produced more than 20,000 paintings, prints, drawings, sculptures, ceramics, theater sets and costumes. He died at age 91 in the south of France. 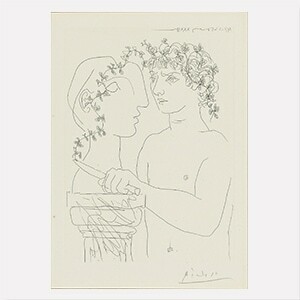 Picasso is without doubt the most famous and influential artist of the 20th century.